Can anyone verify if this is real or 'shopped? If it's real, can't help but wonder if that crack that Nakai made (during the 120429 appearance on his Black Variety show) about her resembling Nono from when 4th Gen first joined had anything to do with it. I don't know what to say about Kuduu's new hair style.. If it was an other member my reaction is " Hoo no it's horrible! T__T" but it's Kuduu so everything is ok..she's still realyl cute even if I don't really like this style. She looks more adult with this hair style. 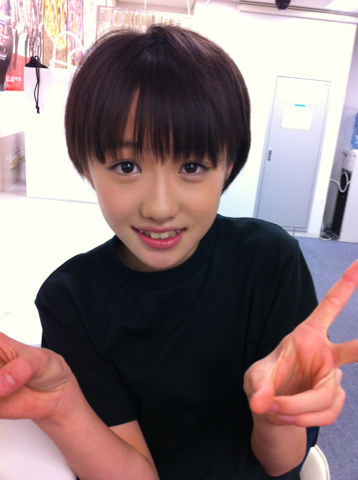 Haruka looks very cute with new cut! She looks even more like a cute little boy! 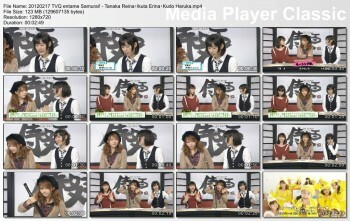 Kuduu sings "Osaka koi no Uta"
Edit: YT links deleted by user so I added MF links. Thanks to mezu from H!O. 1. She is the only idol I know who I really like with a short cut. 3. She's all sorts of awesome. Husky voice ftw. Poor Haruka had some drink mishaps. Translation courtesy of the peeps at Takamaruyo. Earlier this morning Kudu was drinking a cup of tapioca green tea juice while making her commute to the recording studio for this show. Everything was going fine except that the tapioca were too big to go through her straw. That started to annoy her because she couldn’t eat any of the tapioca in her drink. She kept on trying to get some tapioca but 3 or 4 of the balls eventually got stuck in the straw. She didn’t want to let the drink go to waste just because the straw was clogged up so she figured it’d be a good idea to blow the tapioca back into the cup. She tried a few times but it wouldn’t budge. Eventually she got really pissed off and took a huge breath and blew as hard as she could into the straw. There was a lot of juice left in the cup so when the tapioca balls went flying into the cup they sprayed juice everywhere. There was a lid on the cup but there was a big hole at the top for the straw so juice got all over her. On top of all this, Kudu happened to be wearing a white outfit today and she tells Riho and Iikubo that is why she’s all green right now. Speaking of drink related stories, Riho says a little while ago 9/10 gen were having a group text conversation when all of the sudden Kudu sent a message saying “#@$* stupid Mitsuya Cider!! 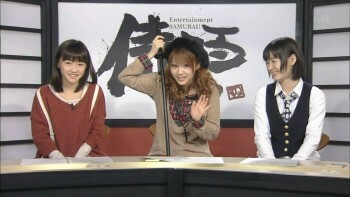 !” Now, Mitsuya Cider is really important to Riho so she was really taken back by this statement. She asks Kudu what was going on at the time? Kudu says that she was at the train station about to catch her line home. She decided to grab a drink so she went to the vending machine and bought a can of cider. She opened the can as she usually would but this time the cider exploded all over her. Normally she’s really good with opening carbonated drinks so it doesn’t spill but she has no idea what happened this time. It got all over her hands and made everything sticky. She decided to go to the bathroom to wash up because her train ride happened to be a long one. When she finished and came out, she found out that she had missed her train and blames it all on the cider. Riho and Iikubo think it was more of the fault of the vending machine rather than the cider. 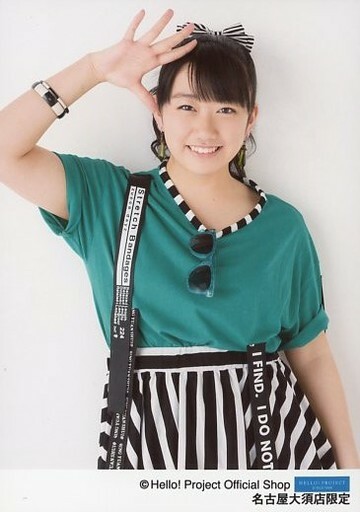 Riho says she shouldn’t be so harsh on cider. Holy crap this one's kinda scary. I really hope this is just soreness from fatigue and not an actual tear; girl needs to watch it with those kicks! Oh man, so young and already knee issues... That does not sound good. I hope they let her take enough rest so that is can heal properly before they rush her out on stage again. Hope it's not too serious!